Well done to all our County swimmers! This year 31 Hertford SC swimmers achieved either a consideration or qualification time for Swim England (SE) Hertfordshire County Championships 2019. The championships take place over 3 consecutive weekends (19th&20th January, 26th&27th January, and 2nd&3rd February 2019) and include both individual and relay events. Acceptance to Counties is based on multiple criteria: swimmers achieving a qualification time are guaranteed to swim at the championships, whilst for swimmers achieving a consideration time, acceptance is based on a ranking system specific to each age group and event (i.e. top 16, 24 or 32 entrants for 50/100m distances, depending on age). Age groups for individual events are 10/11, 12, 13, 14, 15 and 16&Over, with age at 31st December 2019; additionally, relay teams are organised over 3 age groups – 13& Under, 15&Under (Junior) and Open. Out of all 31 swimmers meeting the above-mentioned criteria, 22 entered the championships and 17 were accepted. Well done to all the swimmers who achieved a consideration time this year, what an incentive to work hard towards Counties 2020! Joshua Holland (16&O) and Joshua Trapp (16&O) were the busiest Hertford SC swimmers over the first 2 weekends of Counties. Joshua Holland has this year competed in the 16&O category for the first time, swimming against much older swimmers than him: he started off with one of his favourites, the 100 fly, which he swam in (1;00.59) to reach the final in 7th place and confirm his position in a time of 1;00.81. His second competition was the 100 free, a tough race, which saw Josh touch pad in 57.69 (21st). Back in the water for 2 breaststroke distances, Josh clocked a Personal Best (PB) in the 100 (1;13.54 – 14th) and a time of 33.52 in the 50 (16th). The late Saturday night splash and dash appointment saw Joshua swim the 50 free in a time of 26.24, (claiming 15th place) and preparing him for the highpoint of his Counties the following day: in fact, on Sunday Joshua swam a gutsy 50 fly heat coming 3rd overall (27.03) and repeated the feat in the final, where he claimed a well deserved bronze medal. He finished off his championships with the 100 IM, where he also gained a place in the final (6th place in 1;05.20). Joshua Trapp’s (16@O) commitments on weekend 1 of Counties included the 100 fly (1;04.15 – 18th) and 100 free (57.09 – 15th). These two races warmed Josh up for weekend two, when he could field his favourite sprint distance (50m) in multiple strokes: a powerful 50 breast saw Joshua touch base in 33.96 (18th). He then went to claim a place in the finals of 50 free and 50 fly. Joshua achieved a 6th place in the heats of the 50 free (25.42) and swam around the same time in the final (25.50), coming 8th overall. The 50 fly final was very exciting and was decided at the very last stroke: Joshua entered it in 4th place (27.38) and finished in 27.37 to gain a well earned 5th place. Josh completed his races gaining a 7th place in the 100 IM in a time of 1;05.23. Joe Reynolds (14) achieved PBs and finals in both his races: he swam the 100 breast in 1;21.29 claiming 7th place in the final to finish 8th in his age group in a time of 1;22.86. Similarly, he swam a fast 50 breaststroke heat (36.37 – 6th finalist) and recorded an 8th place in the final (37.20). As for the end of Counties, the three boys have achieved a number of Regional Qualifications Times (RQT). Joshua Holland: 50 free, 50 fly, 50 breast, 100 fly, 100 breast and 200 IM; Joshua Trapp: 50 free and 50 fly; Joe: 100 breast. They are also close to further RQTs. Well done boys!! Laura Malagoli (12) competed in a variety of races. She started off the championships swimming one of her favourite events, the 50 breast. She achieved double PBs swimming a 42.55 in the heats (6th) and improving on this time in the final, where she confirmed her 6th place in a time of 42.36. Laura gained a place in the final in the 50 fly as well: after achieving 8th place in the heats (37.51), she swam the final in 37.64 to confirm her position. Lastly, Laura swam the 100 IM in a time of 1;24.40 (9th), which showed an improvement on stroke length in all 4 strokes. Neo Metz (16&O), our boy Senior Club Captain and also very close to an RQT, swam the 100 breast in a time of 1;14.71, which placed him in 17th position, and the 50 breast in 32.94 which saw him achieve 10th place. The hard work that Neo is fielding on improving his arms recovery speed showed in the 100 IM, where he clocked a time of 1;08.34 (PB and 15th place). Ella Cannell (13) started her racing with the 100back, which allowed her to ‘break the ice’ with this level of competition and to swim in 1;21.61 (19th). Much more relaxed and determined to enjoy the experience, Ella swam the 50 back in a personal best of 36.39 which saw her coming 12th in her age group. The racing highlight for Ella was the 200 back, which she swam with a perfect racing strategy to record a time of 2;51.52 (13th), a massive improvement. Isla Cavill (12), at her first Counties experience, joined her friend Ella in 2 of the 3 backstroke distances: a smiling and excited Isla clocked amazing times in the 100 back (1;25,56 – a 4secs PB – 18th) and 50 back (39.28, 15th). Well done Isla! Finn Menich (15) swam a very convincing 200 free in a time of 2;17.54 (16th), a massive 7secs PB: the hard work he is doing on his frontcrawl arms is already adding efficiency to a very elegant swimming style. Finn also raced the 50 fly to touch the pad in 34.43 (13th). Ciaran Whatmore (15) and Filip Bak (10/11 – our youngest swimmer at Counties 2019) also had an excellent experience at the Championships swimming in the 50 back. Ciaran achieved the final in a time of 34.58 where he confirmed his 8th. Filip clocked a 2 secs PB, swimming in 40.87 and achieving 10th place in his age group. Katie Gorman (13), swam in the 100 free in a time of 1;10.99 (22nd) and performed a great 50 back where she came 7th in the heats (35.57), allowing her access to the final, where she improved her previous time and touched home in 35.25 (8th). Kye Parsonson (14) started off the championships by swimming the 100 back: he clocked a PB in 1;12.43 coming 10th and impressed with the consistent stroke rate throughout the race. He maintained the stroke quality in the 50 back which he swam in 33.27 (PB) coming 9th. On the last day of racing Kye competed in the 100 IM finishing off with a personal best of 1;16.46 (12th). Two 12 yrs old first-time qualifiers, Jack Blake and George Reynolds, completed the contingent of 50 breast Hertford swimmers: they swam in 47.11 (Jack) and 47.9 (George), to achieve 20th and 21st place respectively. Well done boys, you did extremely well at your first high level competition! Harry Roberts (14) has been working very hard on improving his technical skills; he swam the 100 fly in a time of 1;19.93, coming 13th and the 100 free in 1;09.98 (22nd): in both races he showed high levels of concentration and application of the new skills we are practising in training. Maddy Smith (16&O), our girl Senior Club Captain, was a member of the ‘backstroke army’: she competed in the 100 back (1;13.26 – 26th) and 200 back (2;38.12 – 17th). Maddy has been working hard on refining stroke efficiency and body balance in the water, and improvements were already evident in a racing setting. Leonardo Malagoli (14) performed well in the 100 and 50 breaststroke: he claimed 17th place in the 100breast (1.27.62) and 16th place in the 50 breast (39.54). 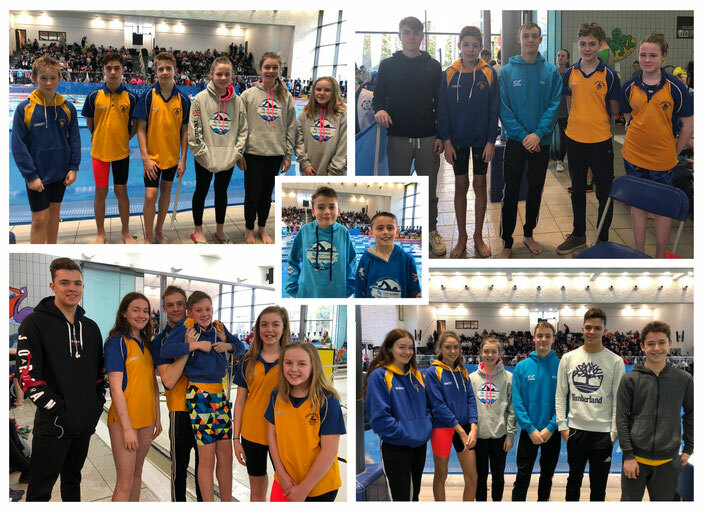 I am extremely proud of all our swimmers over the 2 weekends of individual races at the Swim England Hertfordshire County Champs 2019: they are showing great tenacity and commitment to the new training regime, and are investing massively both on a physical and mental basis. Their body is adapting to the new training demands and type of work on technique and efficiency, and I can already notice massive improvements on both areas. Also, it was a pleasure to spend time with the swimmers and to get to know them a little bit more each day. The aftermath of these championships is not only a credit to their hard work, both in terms of receptiveness and commitment to improve, but promises well for future competitions. Well done Hertford SC and roll on Weekend 3 and the relays! !